U.S. Secretary of Commerce Penny Pritzker today announced the appointment of 23 private sector leaders to the second President's Advisory Council on Doing Business in Africa (PAC-DBIA). PAC-DBIA members – representing small, medium, and large companies from a variety of industry sectors – advise the President, through the Secretary of Commerce, on ways to strengthen commercial engagement between the United States and Africa. "Building stronger commercial relationships with some of the world's fastest growing economies in Africa continues to be a top priority for the Obama administration," said Secretary Pritzker. "Private sector engagement through initiatives like the PAC-DBIA is driving our efforts to expand trade, speed investments, build new technologies, and grow new and transformative industries across Africa." 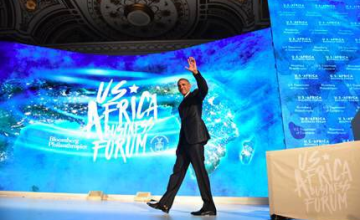 The second U.S.-Africa Business Forum convened Wednesday morning, September 21st, in New York on the sidelines of the U.N. General Assembly. Co-hosted by Bloomberg Philanthrophies and the United States Department of Commerce, the forum was attended by U.S. President Barack Obama and Nigerian President Muhammadu Buhari, who both delivered keynote addresses. U.S. agencies and companies announced plans to invest more than $14 billion on the continent in sectors including banking, construction and information technology. As part of his commitment to deepen engagement between the United States and Africa, President Obama signed an Executive Order (E.O.) at the 2014 U.S.-Africa Business Forum to establish PAC-DBIA. The PAC-DBIA has provided information, analysis, and recommendations on U.S.-Africa trade and investment priorities. Such priorities include job creation in both the United States and Africa, developing sustainable commercial partnerships, building entrepreneur capacity, and keeping the private sector engaged in developing policies and strategies on investment in Africa. Highlights of the previous PAC-DBIA's recommendations include launching the institutional investor roadshow with several African countries and convening an East Africa cold chain symposium. Copyright © 2016 United States Department of Commerce. All rights reserved. Distributed by AllAfrica Global Media (allAfrica.com). To contact the copyright holder directly for corrections — or for permission to republish or make other authorized use of this material, click here.